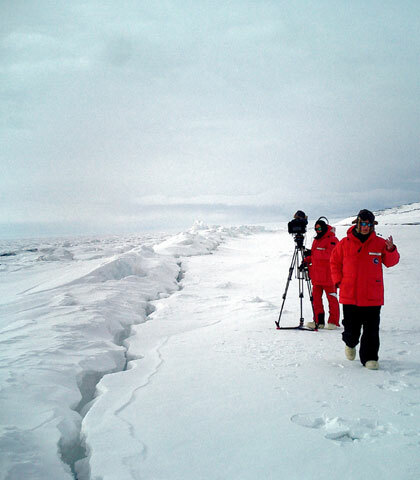 Sheets of ice expand beyond the borders of the screen in Werner Herzog’s Encounters at the End of the World. The director draws our attention to the enormity of the glacial shelves, reminding us that ice was once the means through which nature destroyed planetary life, through which it undid its own handiwork. The memory of this first apocalypse is called to mind as prelude to a coming one. In Herzog’s world-view, we are only guests on the planet, the continental surfaces of which will long outlast the human species. His title is in this way doubly suggestive. Our encounter with these vast spaces is also intended to remind us of all that we fail to see. Where the blue-grey ice meets the blue-grey sky, we detect nature’s purpose emerging only now and again from behind a niveous veil of fog just as it had in Herzog’s Heart of Glass (1976), Nosferatu (1979), and The Dark Glow of the Mountains (1985). Encounters thus tells us more about the director’s distinctive perspective than it does about McMurdo Station, the Antarctic research centre where the film was shot. Herzog’s impatience with the human race, his antipathy to our clumsy and intrusive presence, here takes centre stage. Yet in this film, as in his other works, we are presented with a contradiction: though Herzog may be annoyed with mankind, awaiting the apocalypse and even simulating it on the screen in the form of those desolate, empty spaces where he finds little more than abject traces of human industry, the director likes people, especially the ‘dreamers’ who inhabit Antarctica. He appears to find them endearing, just as he did Timothy Treadwell, the late star of Grizzly Man. How can Herzog have so much antipathy toward humans – taunting and objectifying them, even comparing them unfavourably to ants, apes and other animals – while at once offering them a steady supply of sympathy? That nature is titanic and we are trivial is a point Herzog makes by repeatedly including images of the Ross Sea, a frozen surface so extensive that it would cover the state of Texas. The sun reflecting off the surfeit of snow and ice can be blinding, but Encounters implies that we have blinded ourselves. In one sequence new arrivals to McMurdo prepare for the dangerous eventuality of a white-out, a massive snowstorm, by placing plastic buckets over their heads. During a two-day training exercise called ‘happy camper’, they learn to construct survival trenches and igloos. The activity that involves white plastic pails – each with an eerie happy face scrawled upon it – is known as ‘buckethead’. Predictably the bucketheads lose their way; as is often the case in Herzog’s films, his protagonists find themselves, either despite or because of their intentions, wandering in circles. Self-imposed blindness is, of course, his point. Snow and ice, however powerful they may be, are not our enemies. In willfully forgetting that we are guests on this planet, it is we who have placed the buckets atop our heads. Though Herzog includes historical footage of Ernest Shackleton struggling heroically to overcome the perils associated with Antarctic exploration, our real foe is not the ice, it is us. Herzog has a history of making nature films that seem to set themselves against other nature films. He is slowly reshaping the genre, and in this regard Encounters is no exception. It recalls its many predecessors: a visit to Mount Erebus, an active volcano on Ross Island, suggests scenes from Herzog’s La Soufrií­Â¨re (1977); the seal-scientist sequence reproduces images from Bells from the Deep (1995); and footage of a plane landing on a wide frozen space brings the opening moments of Fata Morgana (1971) to mind. Each of these films are stages in the director’s continuing dialogue with the nature film, but even more they concern our relationship to nature itself. In making sport – more or less directly – of the family-friendly film March of the Penguins (2005), Herzog teasingly asks an Antarctic penguin researcher about ‘gay penguins’, about the possibility of their ‘strange sexual behaviour’, and about whether or not there is ‘insanity among penguins’. This is clever, and it confirms for us that Herzog is refusing a quaint portrait of the penguin world, yet his point becomes poignant when we watch one penguin wander off course, parting from the pack. Herzog describes the penguin as ‘deranged’, and as we observe the lone wanderer helplessly crossing the snowscape Herzog informs us that ‘he is heading towards certain death’. The director’s aim, however, is not to depict animal insanity – he has little interest in penguin psychology – but he instead wants to let the image of the penguin resonate with us. It is doomed and lonely, small and stubborn, and will in the end have been tormented by its own volition. Whether we are penguins or bucketheads makes little difference: though at times we may be likeable, the ice will long outlast us. This is an edited extract of ‘Snow Blind: Werner Herzog’s Encounters at the End of the World‘, first published in the winter 08 print issue of Electric Sheep, which focused on snow in cinema. For more information about this issue, go to our Archive. Read about other films by Werner Herzog: Rescue Dawn, Fitzcarraldo, The Wild Blue Yonder.